Know Thy Personal Records: Are You Aware of Your Indicators? Everyone should be aware of their personal records (PRs). 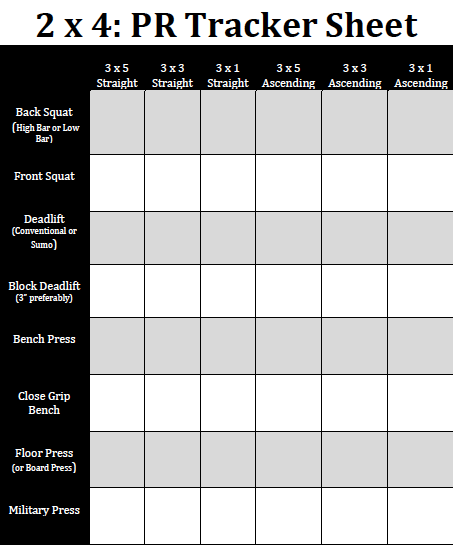 You should know multiple PRs for each variation. Before I did 2 x 4 Maximum Strength, I didn’t have an adequate grasp of my PRs, therefore I wasn’t fully aware of my training efficiency. I wanted you all to have this PR Sheet (click to download) from 2 x 4 so that you can know your indicators of progress. 2 x 4 will help you determine these PRs within 14-weeks, which will benefit your training immensely. With my second time running 2 x 4, I found that my PRs were even more accurate/reflective of my true strength, and I believe that this made a big difference in helping me do well at the powerlifting meet a few weeks ago. Even if you don’t do 2 x 4, you should figure these PRs out over time. Remember: pulls (deadlifts and block pulls) are reset, not bounced, presses (bench, military, close grip, and floor press) are paused for a one second count, and squats (back and front) are taken to parallel or deeper. Make your training harder so that competing (or testing 1RM) is easier. With straight sets, you use the same load for all 3 sets. With ascending sets, you ramp up in weight so that your heaviest load is done on set 3 (so it can be thought of as a maximal set). Your book on glutes is the most comprehensive biomechanical breakdown I have seen. Do you have a model of surface EMG you use?